Pamela Kline is working as a System administrator at Universal Containers (UC). They are using Conga Composer to streamline and scale their document generation process. 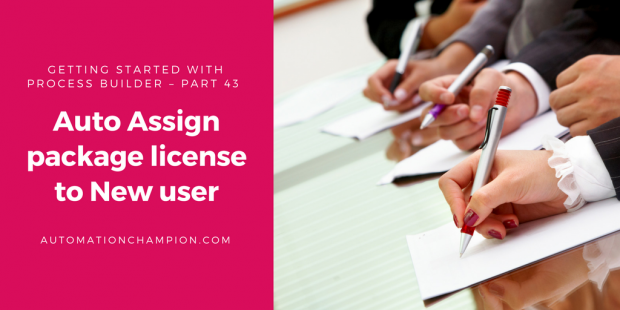 She has received a requirement from the management to auto assign Conga Composer license to new users. There are a few possible solutions for the above business scenario, but we’ll use Flow and Process Builder to solve the above business requirement. Before proceeding ahead, you have to understand UserPackageLicenseobjects and PackageLicense objects in Salesforce. UserPackageLicense: – It represents a license of an installed managed package, assigned to a specific user. PackageLicense: – It represents a license of an installed managed package. Follow the below instructions to create a Process Builder and Flow to solve the above business requirement. 6. Save your Flow with name Auto Assign package license to New users and close the canvas. Don’t forget to Activate the Flow. 1. Click on Name | Setup | App Setup | Create | Workflows & Approvals | Process Builder and click on the New button, Enter Name, API Name and then click on Save button. Note: – I will suggest you implement this first on your developer org, test it and then move it to production. Can you elaborate the reason you’ve added a Time Based Action? Furthermore, can you explain how to auto remove a package license from a deactivated user? (once he is deactivated, the license will be removed from his user). So, Use Record Lookup for Package, connect to Record look up Permission set, Connect to Record create user? I am trying to assign data.com to users who are or will be assign to 3 different permission sets. with monthly 300 limits. Is it possible to assign package license only to users that are assign to certain permission sets? This is a great blog you have here. I always look up to this blog for automation related issues. Thank you very much for taking time to put together such easy and clear steps for automating stuff. Quick question – i do not see the object ‘PackageLicense’ in the flow. Is that removed? or renamed? You can access PackageLicense object either from Flow or Apex. Great blog Rakesh! Is it possible to add permission sets to a new user automatically based on role?